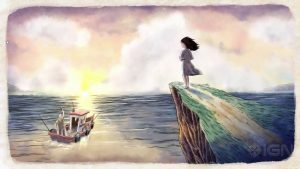 You play as a young girl in search or her father who is lost at sea. 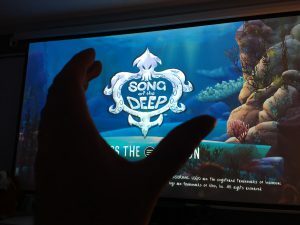 By the power of video games you build a submarine out of scrap in your fathers garage and off you go……..into the deep. Highly colourful and very pretty is how I would describe it so far. Not quite as pinpoint sharp as Ori but still lovely. Where Ori is as tough as nails from the outset this seems to be very forgiving. I’ve played just past the first boss without loosing a life. I think its more about the experience and gentle story telling then a tough challenge. 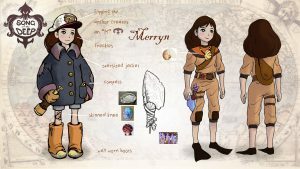 It’s nicely narrated by a girl with a soft southern accent (Irish southern). Can’t remember coming across that before and it just adds to the over all ‘feel good factor’ for this little game. Enjoying it so far and I’ll definitely by back for more. I’ve put a few more hours into this today and it really is opening up. The enemies (that would be sea enemies) are getting tougher, the puzzles are getting sneakier but nowhere on the scale of Ori. My little submarine is getting upgraded nicely. Now with various rockets and a stronger engine so I can go quickly in longer and longer bursts. The story is unfolding the great mystery of where my father has disappeared too and as I progress further darker tones that something sinister is going on are coming to light. 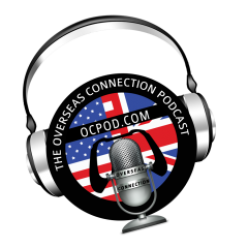 There have been some lovely little touches. There is a section when you are sailing (is that what subs do?) 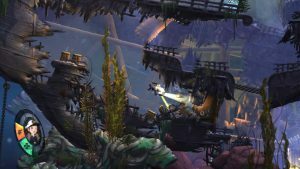 though a level with lots of sunken pirate ships. Little skeletons come to life when you float past and lift a boney arm pointing in the direction of some secret treasure. I’m enjoying this. Feels like I’m into the final third now. We’ll see how it finishes up. I think that was more than a third! Seems like I do that a lot. Probably took another three hours to get this completed. Howlongtocomplete.com has this listed as six hours. More like eight for me. Anyhow, its finished. Really enjoyed this beautiful little game. If Ori and the Blind Forest was a 10 this is definatly a solid 7. Graphically its not just as sharp and a little clunky here and there but overall this was a solid game. Unlike Ori there was only one section I had to repeat a few times to beat. Ori was hard as nails, frustratingly so at times. 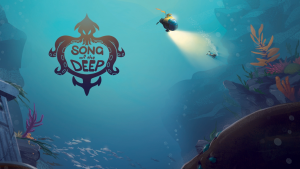 Song of the Deep does offer some good challenges but it’s a much gentler ride. In conclusion, if you enjoyed Ori, or liked it but it was too hard, this is the game for you. 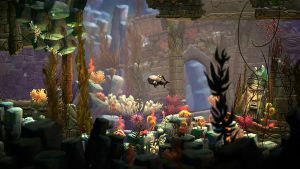 If you’re new to the Metroidvania genre and want something modern to dip your toe into Song of the Deep is a great place to start. Better still, if you see this at as good a price as I bought it, grab it. It’s been very much worth the £4.